Gehl started the project with a Public Space/Public Life survey, because there was a lack of hard facts and figures about the experiences of the citizens in the streets of New York. It was never measured where and how people in New York walk, neither how they spend their time outside on the streets. Gehl Architects discovered that only 10% of the people on the street were children and seniors. Furthermore, they found out that 90% of the space in Times Square was reserved for cars, but 90% of the people were actually pedestrians. This survey gave Gehl Architects the baseline data to set new targets. They wanted to create a new way to move in New York, like bike lanes which connect the surrounding neighbourhoods. The analysis showed that if bike lanes are on the other side of parallel parking lanes it makes walking and cycling safer and better. The Broadway between Times Square and Herald Square was transformed by the flagship ‘Broadway Boulevard’ pilot in summer 2008. Overnight the major squares on Broadway were closed for traffic and they temporary furniture was installed instead. New York’s citizens were involved and gave a positive response to the project. Besides giving people the tools and skills to measure, test or refine ideas and design street levels, one of Gehl’s key services is to simplify inclusive communication. Gehl also tried to communicate to the public why all people should care and that it is everybody’s business. 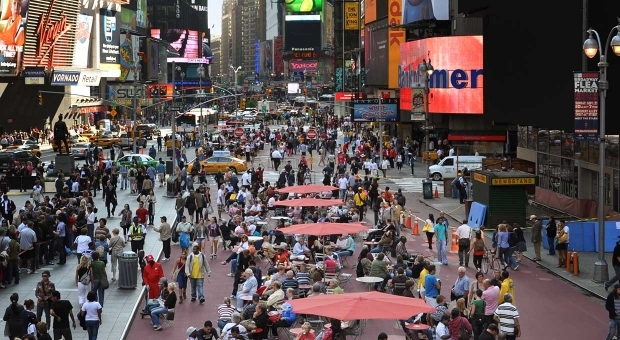 In 2015 Times Square was the first key pilot location to be completely and permanently transformed, putting the creation of people-centred spaces in New York on the city map for good. To move on from the pilot project the Department of Design and Construction implemented the permanent design that was produced by the Norwegian architect firm Snøhetta.